Louisville Graphite can machine sizes from 1/2" to 6' diameter with the ability to treat the material in phenolic or TFE. Parts can rate from 50 psi to 150 psi and temperatures from 350F to 4000 F. All parts are tested and certified after testing. These units are available in standard sizes to approximately 250 feet of heat transfer surface. Typical applications include heaters for pickle tanks and reactor condensers. A wide range of sizes are available but these units are typically manufactured to about 200 square feet of heat transfer surface. Applications include condensers on reactors, battery dilution coolers and reactor recycle coolers. Note: Both types of block units can be manufactured as gasketed or gasket-less design and both can be configured with a wide variety of hole sizes. Standard units are available to approximately 600 square feet of heat transfer surface with special larger designs available. 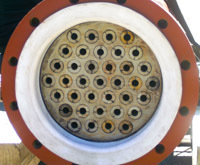 Typical applications are product cooling, condensing and hydrochloric acid absorption. 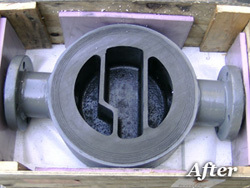 Louisville Graphite can rebuild inline strainer basket housing and manufacturer new. Housings are stripped, cleaned and 10 mils of FRP veils are applied. 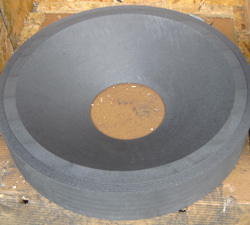 Veils are resin reinforced to 10% typically 1 to 4 layers. Exterior Protection: Polyester resin gel coating 10 mil thickness minimum. Primer coat finish. Two styles of strainer baskets: horizontal inline and vertical off-set. All inlets and outlets are of flanged construction standards. These units can be of various sizes and are available in both single and multiple tube configurations. Characteristically this type of heat exchanger is used in through-the-wall or over-the side design for steam heating but can also be used in cooling service. 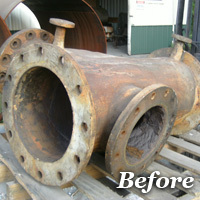 Almost all graphite heat exchangers can be repaired and Louisville Graphite has repaired hundreds of units. Our philosophy is not to simply plug tubes or holes resulting in reduced heat transfer area. We have specialized testing techniques to determine leaks and porosity beyond those used throughout the rest of the industry. This permits us to provide accurate firm price proposals prior to beginning work. 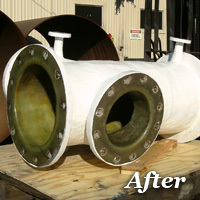 All of our repaired or reconditioned units are re-impregnated. We thoroughly clean all units and repair cracked blocks, tubesheets and domes. 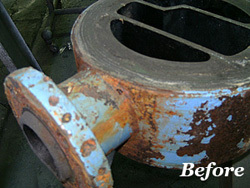 In addition, all gasket surfaces are re-machined to insure proper sealing. 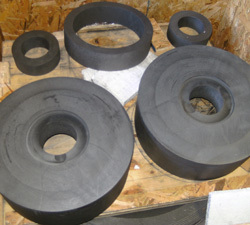 We also supply all new gaskets, packing and bolting. All units have an exterior coating applied prior to shipment. Repairs to the steel shell or other components can be done in-house through our affiliate, KC Mechanical Group. If repairs or modifications are required to ASME Code covered components, these can be done under ASME Code/ NBIC pressure vessel and repair obligations. Louisville Graphite has an extensive inventory of equipment which is already reconditioned or in a near-complete condition. These units are available in a wide variety of sizes and types. These include rectangular and circular block units in heat transfer surfaces to approximately 250 square feet. Our shell and tube units are characteristically available to approximately 600 square feet. Impregnation is a specialty of Louisville Graphite. We can impregnate with either phenolic or Teflon resin. 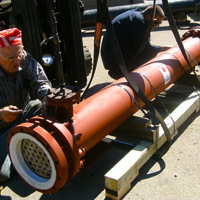 In addition, to new impregnation, we regularly re-impregnate blocks, domes, tubesheets and tubes.